A large gated manor. A servant's quarters sets behind and to the left of it. 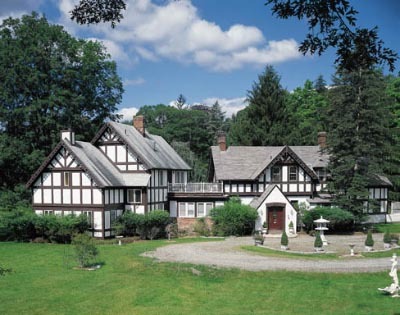 The manor itself is a tudor-style, somewhere in the 15,000 square-foot range. There is a permanent security presence at the gate, and the interior security arrangements are unknown. It's two days after the incident at the Charity Dinner, and all the little Mondsee's are snuggled safe and tight in their beds. Victus Orcus, as silent as death, stalks up to the large estate, eyeing the security and possible entry points visible to him. Switching back and forth between his visual senses while sampling the air with short sniffs from his acute nostrils. The windows appear to be heavy, but there are a lot of them. "They don't pay me enough for this" One of the guards says as he walks alone in the silent night. His every breath shoots skyward a cloud of freezing water vapor. What little light there is reflects in the water crystals floating on the air. Moments later, a second reflection slashes through the night with only the barest of notice. Gurlaghhhhhh A red mist soars into the night sky, and with one final gurgle, a human life has been snuffed out. Victus withdraws the blade from the guard's neck and then wipes the blood off on the grass before hefting the body and skulking to a dark area. Victus strips the corpse of it's clothes and dons the outfit in the darkness, emerging moments later. "Time to relieve someone of their post." Victus says, smiling to himself in an almost bestial way. The guard shack is a small unassuming structure. Built right into the gate. It sits 2 somewhat crampedly. The guard at the computer may be watching videos on youtube. It's hard to tell. The other guard is sleeping? It could just be a really long blink. No, he's sleeping. One door is all that separates you from them. Course there is really large red button. It probably sets off the alarms. Vic keeps his head low as he walks into the little shack. He moves slowly up to the guard on the computer and looks down at him, he is indeed watching a clip on youtube. The one with the dramatic looking hamster to be specific. "Hey man, quiet out tonight huh?" The guard says as he laughs softly to himself at the hamster. "Deathly quiet." Vic quickly draws his blade and strikes at the man's neck.